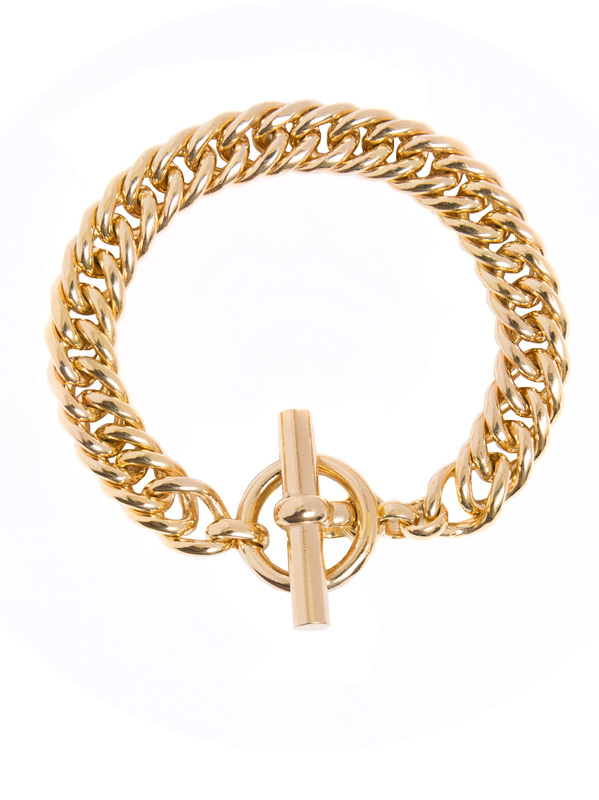 Serve up a bit of attitude and edge with this chunky 23.5 karat gold plated chain bracelet. We are loving the oversized chunky links with the really heavy T bar clasp. Definite arm candy alert. This bracelet weighs 50 grams and measures 19cm in length and 1cm in width. To keep your gold shinny we do advise removing jewellery before showering, swimming, exercising or sleeping. We also recommend waiting until your body lotions and perfumes have settled before putting your bracelet on. An elegant gold plated Virgin Mary charm teamed with a heavy link bracelet makes for an impactful statement piece you'll wear again and again. The sterling silver, gold plate bracelet is 19cms in length, weighs 35 grams and is 1cm wide. The charm is 1.75cms in diameter. Our signature, gold plated t-bar on an elegant belcher chain. The link size and weight make this the perfect layering accompaniment to other much loved bracelets and bangles already on your wrist. The sterling silver, gold plated chain is 19cms in length and is 0.4cms wide with mini t-bar measuring 1.5cms wide. A heavy-grade statement piece, this solid, sterling silver bracelet is worth its weight in style and will give your look instant sass. Mix it in with other bangles and bracelets to make the look your own. The chain measures 19cms in length, weighs 43 grams and is 0.9cms wide.